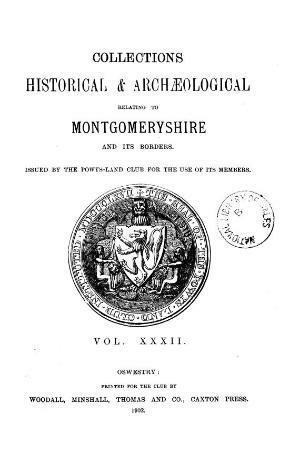 Collections Historical & Archaeological relating to Montgomeryshire, latterly Montgomeryshire collections, is an annual English-language journal containing scholarly articles on archaeological and historical topics, book reviews, and society notes. For digitisation, the publication has been split into three sequences: Vol 1. (1868)-Vol. 31 (1900) (entitled Collections Historical & Archaeological relating to Montgomeryshire); Vol. 32 (1902)-Vol. 47 (1942) (entitled Collections historical & archaeological relating to Montgomeryshire and its borders); and Vol. 48 (1943)-present (entitled Montgomeryshire collections : relating to Montgomeryshire and its borders).